A tenacious scrum-half, Ellis made his England debut as a replacement against South Africa in 2004 and laid claim to the No.9 shirt for the following year's Six Nations Championship. He remained England's first choice scrum-half throughout the next two seasons but was struck down with a knee ligament injury in Leicester's Premiership semi-final clash with Bristol in 2007 that subsequently ruled him out of the 2007 Rugby World Cup. After ten months on the sidelines he battled back to fitness and reclaimed his place in the England Elite Squad but sat out the summer tour to New Zealand. He returned to international action later that year - appearing as a replacement in each of England's 2008 autumn internationals. 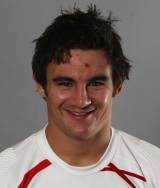 His England chances were dealt a blow at the end of 2008 when he was found guilty of dangerous tackle on Perpignan's Dan Carter during their Heineken Cup clash. He was subsequently handed a six-week ban that will keep him sidelined until the New Year and the eve of the Six Nations. He began playing rugby as a six-year-old with South Leicester, then moved to Wigston for a year before joining the Tigers Academy set-up in 1997. He studied at Leicester Grammar School and De Montfort University and appeared for Leicestershire and the Midlands at age-group level before going on to earn a full house of England representative honours. He made his first team debut for the Tigers in 2001 and established himself as a regular in the No.9 spot during the 2003-04 campaign. Ellis was selected for the 2009 Lions tour of South Africa and made the squad for all three Tests. He was an unused replacement for the first two, which the Lions lost, but came on as a replacement in the third Test win in Johannesburg. After returning to action with Leicester another knee injury forced him onto the sidelines again, this time permanently as he announced his retirement, aged 28.